The condition of a bottle has a dramatic impact its value. Once a common bottle gets a crack or chip, it usually loses half or more of its value. Damage is more tolerated on rarer bottles, but still has an impact on price. So condition is very important to bottle collectors. Many collectors will wait for an undamaged (near mint or better) example before adding to their collection. If you sell a bottle thru the mail and fail to disclose any damage it has, then the buyer has every right to return the bottle for a full refund. Some buyers will only buy at bottles shows and other places to avoid the hassle of ending up with bottles that have undisclosed damage. So it's very important on the Internet, where we send bottles thru the mail, to disclose all damage on the bottle so there are no unpleasant surprises when the buyer receives the bottle. Offering a "buyer satisfaction guarantee" will improve buyer confidence when selling on the Internet, especially through eBay. Following are some terms used to identify the condition of a bottle. I've combined the experience of other advanced collectors in coming up with this rating scale and definition of terms. If I can improve or clarify further, let me know. Mint - bottle is in brand new condition with absolutely no damage. Also called "attic mint" because most bottles of this condition must have been in an attic (i.e. and never underground) to have survived in such perfect condition. A tumbled bottle can never be mint. Near Mint - bottle would be mint except for some very minor damage like small stain, tiny nick, light scratch, small open bubble, or tiny patches of case wear. Lightly tumbled bottles can grade near mint if no other condition issues. Excellent - Between "Near Mint" and "Very Good". Bottle may have some light stain and/or light case wear and/or light scratches but no chips/cracks. Moderate to heavily tumbled bottles can grade excellent if they just retain some light scratches or ground wear. Very Good - some scratches and medium-to-heavy case wear, some inside and/or outside staining. May have some minor nicks and no more than one or two small chips. Good - heavy scratches, substantial case wear, heavy staining, some chips. Poor - cracked and/or chipped. Damaged - large cracks and/or large pieces chipped away. Bubble: a bubble is a air bubble that became trapped in the glass during the manufacturing process. Bubbles are not considered damage. In fact, bubbles usually add to the appeal of old glass. 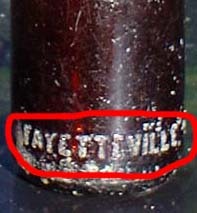 See example of bubbles in an old snuff bottle. Glass made after about 1920 does not usually have bubbles. Crude glass almost always has bubbles. An "open bubble" may be considered damage - see below. A lot of small elongated bubbles, closely grouped together, are called seed bubbles. 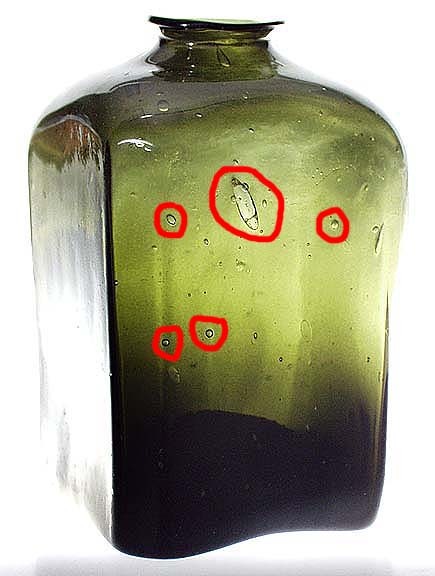 See example of seed bubbles in a green whiskey bottle. Bruise: same as "fish eye", except some bruises may be more clear than whitish. A faint bruise is more clear, and a more pronounced bruise is whitish (i.e. a fish eye). See example of heel (i.e. edge of base) bruise. Case wear: scuffs, small scratches, and wearing away of the embossed lettering caused by the process of recycling the bottles. A case wear ring may be seen around soda bottles that have been rolled frequently across the rollers of a recycling machine. See example of heavy case wear on embossing. See example of case wear ring. 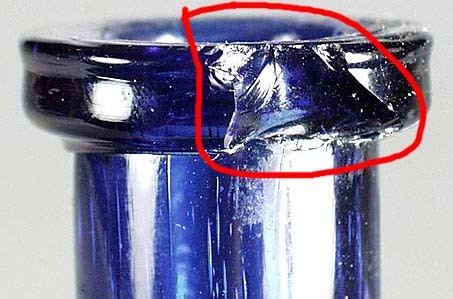 Chip: a spot on the bottle where a piece or chunk or glass has been lost due to damage. See example of lip chip. Coated: a shellac or other type of coating that covers bottle, usually in an attempt to conceal heavy case wear. Sometimes mineral oil is used to coat the bottle, which leaves it with a distinctive oily feel but it does hide the case wear. See example of coated bottle. Crack: a usually uneven line inside the glass that is the result of damage. See example of long crack. Crazing: vertical lines in neck of bottle that almost look like faint cracks but are the result of twisting and cooling process during manufacture. Ding: small impact mark, larger than a ping but less than 1/4". See example of a larger ding. Note that the glass is crunched at the impact mark. 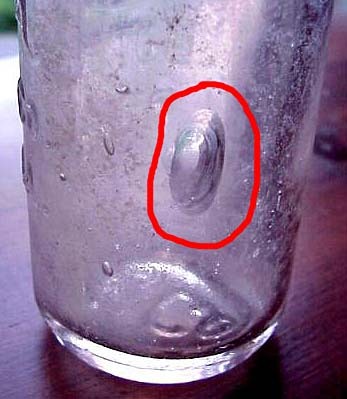 A ding larger than 1/4" is called a "bruise" or "fish eye" if that glass remains intact, or is called a "chip" if the glass is removed from the impact spot. Fish eye: whitish circular mark on surface of glass caused by impact. Flake: very small and shallow chip, typically less than 1/4" wide and less than 1/16" deep. Flash: a very faint "crack" - bottle sometimes has to be turned a certain way to see it. 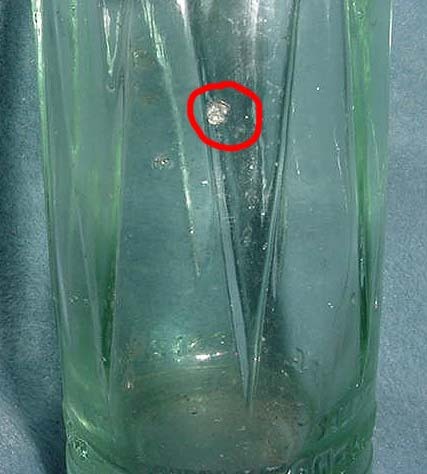 Gouge: a area of glass that is missing from the bottle, typically when a "fish eye" is removed. Ground wear: a bottle that has been cleaned may still retain "pitting" and other marks that are the result of the bottle being buried underground. Hairline crack: a very thin and short crack. Nick: very tiny chip, less than 1/16". Open bubble: a bubble that has become opened to the outside air, either inside or outside the bottle. Outside open bubbles are sometimes considered damage since they may result from impact to the bubble area, but open bubbles are also seen as the result of the crude manufacturing process. At any rate, any open bubbles should be disclosed when describing the condition of a bottle. Ping: small impact mark, typically smaller than 1/16". Smaller than a ding. Pitting: small little pin-size holes in the outside of the glass that are the result of glass being underground. Popped-out fish eye: a bruise (or "fish eye") that has popped out, leaving a curved chip in side of the bottle. See example. Repair: epoxy is sometimes used to repair a bottle by filling in the missing piece with epoxy resin that closely matches the original color of the glass. These repairs are sometimes done so well that they cannot be detected by collectors. To be sure, expose the bottle in the dark to a strong black light - any epoxy repairs will glow a bright white while the rest of the bottle looks dark. Sorry, but those portable hand-held black lights are not strong enough to make the epoxy glow. 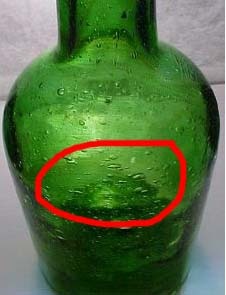 Scrape: a mark on the outside of the glass, sometimes caused by a shovel scraping the bottle. 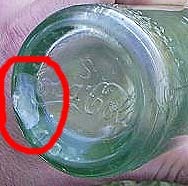 Scratch: small lines on the outside of the bottle caused by the glass being scratched by a sharp object. Stain: a whitish film on the bottle that typically results from mineral deposits while the bottle was underground. This stain can be cleaned. Bottles with labels may also have original content stain which is the remants of the original product (e.g. medicine, ink, ...) that has long since evaporated.